It’s interesting in life when you come across people who don’t understand the impact they are making. 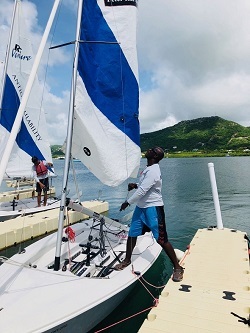 In the case of Sylvester Thomas, Chief Sailing Instructor at Antigua’s National Sailing Academy, that’s probably because what he does and how he does it is so much a part of him. A few days before we sat down for this interview, as we walked back to the Sail Loft post lesson (more on that another day! ), the Class of September 2018 had arrived. The new kids on the block are from St. Andrews School, average age about 9, glee level off the scale. Huge smiles and open minds to what was to come. As we crossed the lawn at the Academy I asked Sylvester, ‘Have you ever thought about the fact that you are changing these kid’s lives?’ I guess I knew the answer before Sylvester gave it, a short, sweet, ‘No”. When we sat down to talk more about his role a few days later, we went back to where this all started for Sylvester. Now in his mid-forties and not from a sailing community he describes that at age 26, and with high hopes of a raise in his job as a baker, his then boss made it very clear the only raise he would be getting is from the yeast he added to the bread. That was the motivation he needed to jump on his bicycle and take himself to Sunsail to ask if they had a job. He was told no, but a week later the fateful call came which would change the course of his life. Over twenty years ago, Sunsail was operating a hotel on the North Coast which attracted tourists to Antigua who loved sailing. Interestingly if you speak to many ex-pats now in Antigua, a number of them first came to Antigua staying at that very same hotel. Beginning as beach assistant Sylvester worked his way up to watersports manager completing two rounds of sail training in the UK, Sailing Instructor at the UKSA and Senior Sailing Instructor at Calshot Activites Centre. Sadly in 2008 as recession kicked in across the world, Sunsail announced the closure of the hotel. 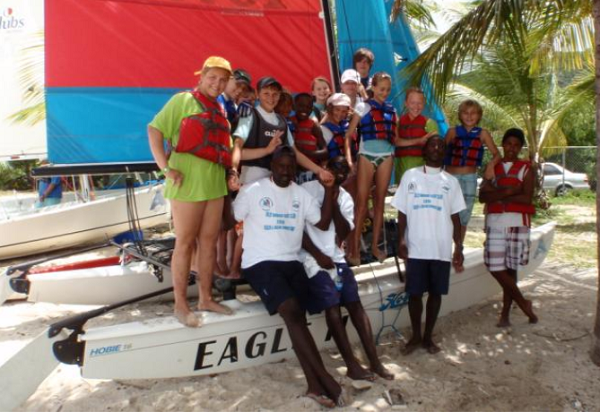 Fortunately the Jolly Harbour Yacht Club started a youth sailing programme on North Beach in Jolly Harbour. Enter Sylvester who started working as the instructor for the Youth Programme. The Programme grew to three instructors and through fee paying lessons, volunteer help and sponsorship was able to fund free lessons to Antigua children. Unfortunately, infrastructure and funding challenges meant the programme wasn’t sustainable and so Sylvester moved on to work as Dockmaster at the Jolly Harbour Marina. It was around this same time that the National Sailing Academy was created and board members Brian and Pippa Turton took Sylvester to meet founder Elizabeth Jordan and so began his journey at the Academy. 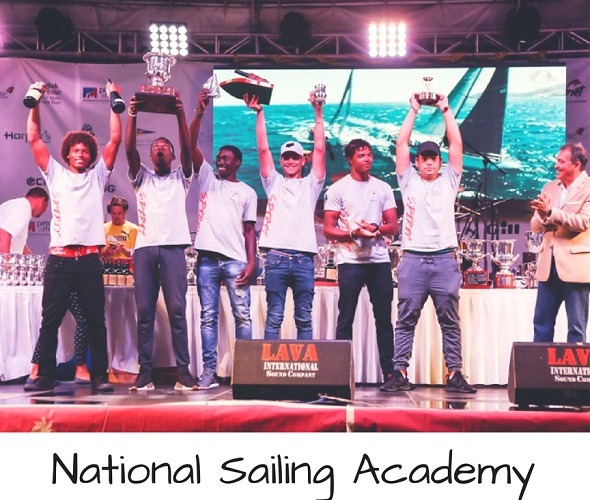 The National Sailing Academy take first in class at Antigua Sailing Week -Mauriceson third from left, Jules fifth from left. Some of Sylvesters charges include Jules Mitchell on the original youth programme in Jolly Harbour, Junella King who was the potential youngest member of the Team Antigua Island Girls about to make the 3000 nm row across the Atlantic, and overall fifteen youths who he went on to train as instructors. Some are now working for him at the Academy and some at other hotels around the island. His newest proteje is Mauricson Valentine, one of the young sailors who was part of the youth team who won their class in Antigua Sailing Week this year. What is interesting in discussing the programme and the opportunities it affords the youths who have passed through it so far (latest estimates are 1,000 young Antiguans), is that Sylvester sees that not all youths are equal, some take to the experience immediately and love it, and are good at it, some love it and aren’t, but that’s ok, and some don’t like it. But it’s a place for building confidence, educating the kids about the broader yachting industry and being a stepping stone for them into it are clear. Of the yachting industry Sylvester says since he learnt to sail he has never been without a job. He is living proof of what the industry can do for you. For some youths it’s not about racing it’s about the experience, but for others getting on the first rungs of a career in racing is possible. In that kind of situation Sylvester is a big proponent of the work the NSA do with Antigua Yacht Club. Identifying the pathway a youth might want to take and then ensuring they get the experience they need to do so, may mean the youth is trained at AYC. Ultimately, for him it’s about the youth and what is needed to progress them. In discussing the Academy and where it is at Sylvester expounds on founder Elizabeth Jordan’s vision in recognizing the need to create the school. ‘Elizabeth should be recognized in the highest way possible for what she has achieved’, he says. That sentiment comes through from many of the instructors and people involved in the Academy. His biggest concern lies in the future sustainability of the school given that it offers the opportunity to all children in Antigua as part of the national curriculum to learn to sail and swim. The Academy now operates at capacity both in terms of the number of children to instructor ratio, but also based on transportation it has. He also sees the capacity to look at one other operation outside of the English Harbour area, but again the question of finance come into play. In an interesting turn of events, Sylvester has just been trained along with one other instructor, to deliver a pilot course to watersports employees based in resorts throughout Antigua. Created in conjunction with Elizabeth Jordan and the Caribbean Sailing Association, there are plans to roll the course out across the region. The first eight delegates from Elite Island Resorts, Blue Waters Hotel and Jumby Bay will get to experience the course in mid-October. Returning to the original question, ‘Have you ever thought about the fact that you are changing these kids’ lives, the evidence is clear. In his signature calm, quiet and humble manner, Sylvester is doing just that, one child and one tack at a time! The National Sailing Academy also offers sailing classes for adults as well as kayak, stand-up paddle boarding and scuba diving . All revenues earned are ploughed back into funding the non-profit operation. If you want to find out more email: info@nationalsailingacademy.org, visit www.nationalsailingacademy.org, or call in and take a look for yourself. Located on Dockyard Drive, a small on-site restaurant also offers affordable meals and a great watch spot to find out what all the hype is about.